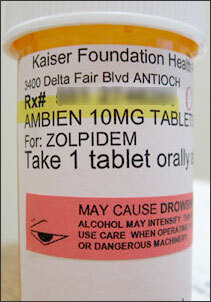 What side effects doesn’t Ambien cause? We used to think the rare and troubling four-hour erection was about as weird as it got in the world of prescription-drug side effects. But then came Ambien, the sleeping pill that has been found (in rare cases) to cause people to drive without realizing it and/or “unlock a primitive desire to eat,” according to The New York Times. As with the sleeping drivers, patients who have this Ambien related-eating disorder apparently don’t remember anything about their nighttime snacks—they are usually tipped off by the candy wrappers all over the house or the crumbs in the bed. (Presumably, if they drive and eat in their sleep, there are fast-food wrappers littering the minivan.) Perhaps the Ambien disclaimer should be tweaked: “Side effects may include downing four pints of Häagen-Dazs, a party-size bag of Doritos and two rolls of raw cookie dough between the hours of 3 a.m. and 4 a.m. If you believe you are at risk for driving unbeknownst to you while under the influence of Ambien, have your significant other hide your car keys before taking Ambien. If you do not have a significant other to hide your car keys, sell your car.” We’re just here to help.